2.1 What Do We Have Here? 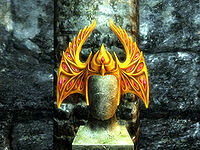 Find the 24 gems to restore the Crown of Barenziah. Quest received upon finding the first "Unusual Gem". Find one of the 24 "Unusual Gems" scattered throughout Skyrim. Become a full member of the Thieves Guild (if not one already). Have the gem appraised by Vex at The Ragged Flagon in Riften. Collect the remaining stones of a full set and return to Vex. Retrieve the Crown of Barenziah and return to Vex. In your travels about Skyrim, you will come upon an ornate jewel (one of twenty-four spread across Skyrim) called an Unusual Gem. Subsequent actions after you acquire one of these gems depends on your membership status with the Thieves Guild. 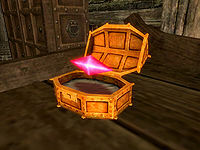 If you are not a member of the Thieves Guild, picking up the first Unusual Gem you encounter will activate the miscellaneous quest objective: "Bring the Unusual Gem to an appraiser". Depending on your past travels and interactions, following your objective marker will likely take you to Maul, a Nord thief in Riften. If you have not yet spoken with Maul, he will seek you out with some unsolicited advice. After the conversation, ask him what he knows about the gem. He will tell you that you need to show it to Vex of the Thieves Guild, to find out what the gem is worth. Maul will also tell you that to get to Vex, you must first become a member of the Thieves Guild. If you press for information on the guild, you will be told to find Brynjolf in Riften's marketplace. You can find him as suggested, or in the Bee and Barb at night. Talking to him will activate the quest A Chance Arrangement, which is the first step towards becoming a member of the Guild. Once you have access to The Ragged Flagon, seek out Vex for her appraisal of the gem. She will tell you that it is one of twenty-four stones that were pried from the crown of Queen Barenziah by a thief in an attempt to cover his tracks, and that only the complete set of twenty-four stones would be worth anything. If Maul does not tell you to find Brynjolf, you can seek him out yourself. If you are a full member of the Thieves Guild when you pick up the first stone, the quest is immediately activated with the objective: "Bring the Unusual Gem to Vex in the Thieves Guild". Find Vex in The Ragged Flagon. She will tell you that it is one of twenty-four stones that were pried from the crown of Queen Barenziah by a thief in an attempt to cover his tracks. She will further inform you that the stone is worthless on its own, but that if you can find the other twenty-three, the collection would be worth a substantial sum. After showing the Unusual Gem to Vex, the gems are renamed "Stones of Barenziah," and will appear as such in your inventory when in your possession. You must now find all twenty-four stones. Begin the Dark Brotherhood questline or start the Destroy the Dark Brotherhood! quest. Join the College of Winterhold by completing First Lessons. 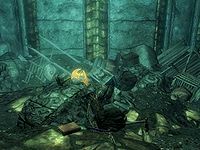 You must also start Under Saarthal and progress at least to the point where Tolfdir tells you to speak with the Arch-Mage; until this point, the Arch-Mage's Quarters are locked behind an inaccessible door. Aside from those, most other gems can actually be obtained at any point in the game. Many are located in places that you will be sent to during other quests, so you may want to consider getting the stone concurrently with the quest. map Prior to patch 1.4, the stone is located in the Thalmor Embassy in Elenwen's Solar on the second floor. After patch 1.4, inside Reeking Cave next to a corpse in the back. † Will be marked as stolen unless you are of an appropriate faction rank. Show Vex the full set of Stones, and she will have you travel to Tolvald's Cave to retrieve the Crown of Barenziah. The cave is three layers deep, and crawling with Falmer, so be sure to prepare yourself. When approaching the crown, three hostile Dunmer Ghosts will appear and attack. After returning with the Crown, you will receive the permanent effect Prowler's Profit, which significantly increases the chance of finding gems in randomized containers. The gems that will be marked as stolen may say "take" instead of "steal" when acquiring them; in this case, they will still be marked as stolen and you will be reported for taking them. If your game is prior to patch 1.4 and you haven't recovered the stone from within the Thalmor Embassy, there are multiple workarounds detailed on the location page. There are no quest markers for the stones, so unless you intend to find all the stones by chance, it may be best to print out a list of their locations and cross each one off as you find it. It is impossible to remove this quest from your list without joining the Thieves Guild; if you don't want to do that, you may be better off ignoring any Unusual Gems you come across, as they have no other use in the game and cannot be removed from your inventory without Vex. The stone in the Dark Brotherhood Sanctuary is not generated by the game until either of the related quest lines is started. Text in the game code suggests that you were originally supposed to see Tonilia about the gems. The dialogue about buying the gems would have made much more sense in that context. If you gather all 24 stones before getting Vex to identify them it won't advance to the stage where you need to turn them back in to her and your journal will still say to recover the gems (24/24). To fix this, type these console commands: setobjectivecompleted TGCrown 20 1, followed by setstage TGCrown 30. The Prowler's Profit may not appear in the Active Effects menu, but it should still be in effect. Once you've learned that these Unusual Gems are actually Stones of Barenziah any new stones will no longer stack in your inventory, previously collected stones will stack when presented to Vex however. Repeatedly pressing the activate button while picking up a Stone may shortcut this quest. Your inventory will only increase by one Stone, but your quest progress will increase by more than one, allowing you to return to Vex and move onto recovering the Crown before visiting all 24 Stone locations. Sometimes the gems that are supposed to be in Fellglow Keep and Pinewatch Sanctuary don't appear and will prevent progress with the quest. Type the following three commands into the console for a workaround: set TGCrownGemsFound to 24; set TGCrownGemsTotal to 24; setstage TGCrown 30. This will not update the journal entry with the correct number of gems found but it will unlock Vex's dialogue to proceed with the quest. The finished crown has 25 stones in it, even though only 24 exist. When found without the stones, all 25 of the crown's slots are empty. This bug is fixed by version 2.0.6 of the Unofficial Skyrim Patch. The Dunmer Ghosts in Tolvald's Cave may become hostile to each other due to an improper faction setup. There´s a chance only a single male Dunmer Ghost shows up by the crown and that it's not hostile. Upon talked to, he would say something along the lines "It's been so many years...". He can also be pickpocketed for an Elven Shield. ? If you've angered Maul, he will not speak with you about the Unusual Gem, even though he's the quest target. ? As noted in the text, this can be bypassed by simply joining the Thieves Guild and ignoring Maul. 200 Finishes quest I've brought the Crown of Barenziah back to Vex, who has restored it to its original condition where it now serves as a paragon for the Thieves Guild. On the PC, it is possible to use the console to advance through the quest by entering setstage TGCrownMisc, TGCrown stage, where stage is the number of the stage you wish to complete. It is not possible to un-complete (i.e. go back) quest stages, but it is possible to clear all stages of the quest using resetquest TGCrownMisc, TGCrown.